Due to popular request, I’m sharing my coveted natural skincare routine. Just kidding! Those of you who know me, know I’m a plain jane when it comes to anything cosmetic or skincare related, however, I do have a general routine that I stick to on a daily basis. Do I break out? Yes. Do I have the first signs of aging? Yes. Are there days/weeks when I don’t drink enough water or don’t get enough sleep and my skin feels like an alligator? Yes. This is not a “I will have perfect skin all the time,” solution. This is a cut back on toxins and minimalize my skincare routine solution. I try to keep things as natural and toxin-free as possible. I also keep things fairly simple. The reasoning behind this is partially a laziness factor (I’m very low-maintenance), but I also believe that with many things- especially skincare- less is more. Truly healthy skin starts with a good amount of water intake, eating healthy foods and making sure you get lots of needed rest. Everything in moderation. Even for those who are regimented from a dietary and lifestyle perspective, it’s important to take a look at the products and chemicals you’re putting on your skin. Your skin is the largest organ on your body, and it’s porous- meaning it absorbs almost everything you put on it. In East Asian Medicine, one of the diagnostic tools we use is looking at the face. The Shen, or human spirit, can be seen through the face and eyes. Clear eyes, healthy tone and good color all come from good health. You know those people who just shine from something internal? You look at them and they are beautiful in a way you can’t quite explain? This is good and healthy shen. It starts with nutrition, exercise and a good healthcare regiment (including regular acupuncture). I know, this seems like I a long list, but I am sharing with you today all the brands and items that I use, all relatively affordable (especially compared to “designer” brands). I am as cheap as I am low-maintenance. Find a cleanser that isn’t too exfoliating or moisturizing. Foaming, gel or cream works well with this skin type. Rebalance: A great natural astringent is witch hazel without alcohol, I apply this daily after my wash and let it completely dry before moisturizing. Moisturize: I really love this Alba moisturizer, it’s light and smells great. It’s great for my combination skin. I also love Dr. Guo’s Skin tonic, which I’ll put on 2x/week in place of my regular moisturizer. Exfoliate: 3x/week. I love Jason Apricot Scrubble. Moisturize: at the end of your shower and before drying off, apply grape seed oil after you exfoliate onto face and drier areas of your body (knees, elbows, etc.). Dr. Guo’s Skin tonic (see above). Homemade Facial: Mix half water, half apple cider vinegar (Braggs is my favorite) with bentonite clay until it becomes a muddy mixture, apply to your face, let it dry, and then rinse. I start with a tablespoon of water, a tablespoon of vinegar and two tablespoons of dry clay, slowly adding more clay until I reach the desired texture (a mud-like substance). I will alternate between this face mask mixture and plain raw manuka honey, which is great for anti-aging and moisturizing. I also give myself facial acupuncture once every week to two weeks. You can find out more information here. Get a good loofah and pumice stone! Make sure to exfoliate 3x/week, especially extra dry areas including elbows and feet. In the winter, I use grape seed oil at the end of my shower for additional moisturizing. In the winter, I apply my favorite homemade body butter. It’s amazing! I also really love Emily cream for the redness and irritation that may occur with dry, winter skin. Emily cream is also really great as a hand cream to throw in your bag or for any irritating skin conditions including: eczema, psoriasis, rashes (including diaper rash), keratosis pilaris and rosacea. Everyday body lotion I really love: Lotion for Everyone and Naked Bee brands. Think about your exposure to the elements. Stay covered up in the winter with warm clothes and shoes, keeping your face covered. In the summer lather up with non-toxic sunscreen like Badger wear sunglasses and an eco-friendly UPF hat or clothes. When looking into getting massages, facials, mani-pedis or any spa services, search for organic spas in your area. It’s worth spending the extra money on quality products being put on your skin. Keep in mind that less is more and if you have any other questions, never hesitate to reach out. If you’d like to schedule a visit, click here for scheduling. Otherwise, check out my website, Facebook, Instagram, or Twitter for more information! I can still envision my medicine cabinet from growing up: vaseline, Benadryl, Nyquil, throat spray and bandaids. My mom literally kept anything and everything for any and every ailment you could imagine (she also had an embarrassingly large stash of hotel soaps, shampoos and conditioners that may have been obtained by illegal means, but that’s a story for another time). When I had my daughter, I wanted as natural a medicine cabinet as possible, while at the same time having the essential Western items available as well. An important thing to remember is to check expiration dates 1-2x per year for all products. Although most herbal supplements and medications will only decrease efficacy over time, some may be dangerous to take when expired. Yoga Mat & Meditation Pillow: Okay, you can’t fit this in your medicine cabinet, but it’s good to keep one set up at home for that emergency child’s pose and/or meditation. Rescue Remedy: This is a Bach’s Flower Remedy that is good for anxiety or trauma. It can help with sleep and is made in a children’s form with no alcohol. Bone Broth: from a Chinese perspective, “blood deficiency” can cause a plethora of mental health issues including anxiety and depression. Bone Broth will build blood and you can get it in powder or pill form or make your own. CBD Oil: Reduces anxiety without the THC, or hallucinogen of regular Mary Jane. Neti Pot & Salts: I will sometimes add a drop of tea tree oil to help with any potential sinus infection. Eucalyptus Essential Oil: You can combine 10 drops with a 1/4 cup of coconut oil for your own at home vapor rub, you can also add a few drops to a bath or facial steam to clear the sinuses (peppermint oil also works WELL). Elderberries or Elderberry Syrup to boost immunity, can also add to a tea. Echinacea Tea: Traditional Medicinals makes an Echinacea Tea with Elderberry that is amazing! Throat Coat Tea: Also by Traditional Medicinals, soothes sore throats. Cool Mist Humidifier in the winter for dry air and to open up sinus passages. Essential Oil Diffuser: You can get these with or without water added, can add eucalyptus, peppermint, or any other essential oil you’d like. Dr. Mom Otoscope: A great way to check for inflammation. Colloidal Silver: Colloidal silver, unlike traditional antibiotics, has antifungal, antibiotic and antiviral properties. You can put a couple drops in your child’s ear as an alternative for ear infections. Garlic Drops: Garlic helps boost the immune system and reduces pain. You can also place a couple drops in the ear for pain. Onion: I know, I know, now I’m just getting CRAZY. However, this is one way to help ear ache. Heat up the onion so its warm, then scoop out enough of the center to fit an ear, place over the ear for about 10 minutes. You can also use onion drops if that’s easier. *Note: If your child’s eardrum is extremely red or irritated, they have a high fever or are feeling lethargic, please bring them to their pediatrician as soon as possible. Calamine Lotion: Great for bug bites, burns and other skin conditions. Here’s a great recipe for DIY Calamine Lotion. Emily Cream Hot Skin Soother: Great for rashes or poison ivy. Bentonite clay: Bentonite clay makes a great face mask, but can also be used on cuts, scrapes, burns and other skin conditions. Arnica: You can apply this topically, or take pellets for pain reduction. Peppermint tea & Ginger tea are great for anti-nausea. Probiotics: Probiotics help replace the healthy gut bacteria that leads to better digestion. They are great for restoring gut health and treating digestive issues. Apple Cider Vinegar: Take a tablespoon of ACV with water daily to help promote better digestion, reduce inflammation and help with acid reflux and food regurgitation. It’s also great to take at the start of a cold to knock the pathogen out of your system. Throat Coat tea: LOVE this tea! It helps with sore throat and discomfort. Make sure you let it seep for 10 minutes or so. Loquat Syrup: Helps to clear the lungs, build immunity and treat sore throats. 37 Cream: Available in-office, this Chinese Herbal version of icy hot is amazing for muscle pain and weakness. Foot Soak: Put a quarter cup of epsom salt and 3-5 drops of lavender oil in a small to filled with hot water. Soak the feet 10-20 minutes before bed. Melatonin: This can be a great sleep regulator. It can help you fall asleep, and if you get the slo-release can help you stay asleep, too. Start with a smaller dose and work your way up as needed. Valerian Root: I’ll often alternate between Valerian Root and Melatonin so my body doesn’t get adjusted too much to one. Valerian can also help a lot with anxiety. Cal/Mag: This combination of vitamins can help move bowel movements. Aloe Vera: Aloe Vera is a natural laxative and because it is anti-inflammatory can also treat a plethora of digestive disorders. Peppermint essential oil: place a couple drops on a tissue and place it near your pillow as you rest. Epsom Salt Bath: Magnesium will relax you, and tension is one of the leading causes of headaches! 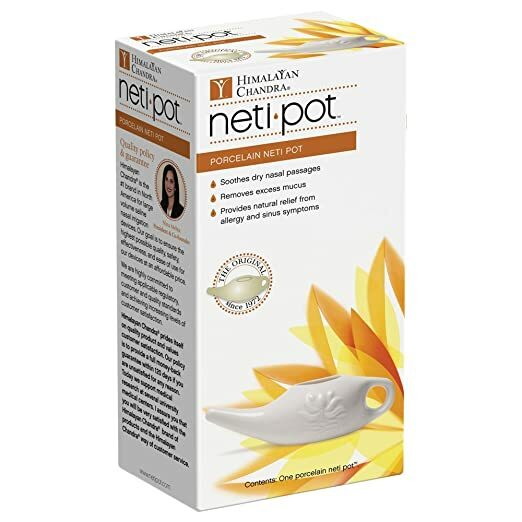 Neti Pot: I can’t praise the nets-pot enough! It clears the nasal passages of allergens, reducing inflammation and allergic rhinitis. Raw, local honey: Raw honey contains local flower pollen, it is said that repetitive exposure to small doses of allergens can help treat allergies naturally. For more information on treating allergies naturally, visit my blog. Heating Pad: A good plug-in heating pad is an essential item to help reduce the pain of cramps and headaches that go along with PMS! Wellness Mama has a wonderful blog about natural treatments for PMS you can check out here. *Remember, most herbal remedies are not regulated or supported by the FDA. Make sure you are buying, whole food, organic vitamins from a quality source. Check with your healthcare practitioner before taking any vitamins, supplements or alternative therapies. Most people don’t have a regular meditation practice. I can’t stress to patients enough the importance of a coping mechanism for the stressors of everyday life. We are, at our core, animals. From our deepest roots, our fight or flight is a gut reaction to outside stressors. Instead of being chased by tigers, like our ancestors, we have families with constant demands, deadlines at work, and never-ending to-do lists. So how often are you in that fight or flight mode? Is it a constant that is slowly (or quickly) draining your adrenals, affecting your sleep, or causing you digestive upset? Do you get tension headaches? Migraines? Panic attacks? What is your coping mechanism? Do you have one? People decompress in many ways: running, reading, therapy, yoga, etc. Having an outlet for stress from a physical and emotional perspective is important, but there is a mind-body connection that can go overlooked. We are also energetic and spiritual beings and it’s important to address all the aspects of ourselves for better health and happiness. The benefits of meditation are numerous. It takes the body out of that fight-or-flight mode into a state of calm. This allows the body to function better, digestion moves more smoothly, inflammation decreases and tension melts. It’s a way to interconnect with self. It’s an even better way to interconnect with other humans. So, that being said, the question is: “how do I get started?” Many people think meditation is sitting in a quiet spot and not thinking. It’s nearly impossible for the average person to do this effectively, so here are some tips I recommend to get started. Having a designated meditation spot helps create an environment of calm. Set up a space away from technology and noise; put your phone in the other room or out of reach, face down and on silent mode. You can light a candle, or put on an oil diffuser with relaxing music. Get a yoga mat, a pillow or a meditation pillow and set up a comfortable place for you to sit or lie down. If thinking about your meditation space gives you an immediate sense of calm and well-being, you are doing it right! If not, don’t be afraid to change things. Maybe you like more lighting, or silence. Play around with different environments until you get the right one. Realistically, your first session isn’t going to be a huge, transformational, 3-hour interconnection with god. You’re going to be impatient, you’re going to think about groceries, and work, and the kids (who’s picking them up again?). THAT’S OK. Your mind is going to wander. Start with 3-5 minutes. Set a timer on your phone, put it face down- out of hands reach and start. 3-5 minutes a day to start, not bad, right? As you sit there, where are you? Like I said, your mind is going to wander into a thousand different directions (you’ll be shocked at the tangents you can explore as you try to settle into silence.) So let the thoughts come in, let them linger shortly, then let them go. They aren’t going to help you right now, in this space, in this body. Be as present as possible. There are some breathing techniques that can help distract your thoughts and calm your body and mind. Start with counting the breath, breathing in to the count of three, breathing out to the count of three. Over time (and several meditation sessions) build up to seven. Or add a pause at the end of each breath, holding the breath out and holding the breath in. There are more advanced breath work options available the more you practice. Some of my favorites are alternative nostril breath and three part breathing. Start slow, then gain momentum. You need to make meditation a part of your every day routine. How do you do that? Schedule it! Add it to your google calendar for the same time every day. Will you meditate every day if it’s first thing in the morning when you get up, or do you find it more helpful at night after the kids have gone to bed, when you can wind down and use it to prep for sleep? You decide, but make it a regular part of your day. Like most things, the more you practice, the easier it becomes! Be patient with yourself and the process. It’s definitely worth the patience and dedication and will soon shape you into a more patient and calm human! Regular acupuncture visits also help calm the mind and will assist with your regular meditation practice. If you’d like to schedule a visit, click here for scheduling. Otherwise, check out my website, Facebook, Instagram, or Twitter for more information. Many patients come in and ask me, does Acupuncture treat seasonal allergies? The Long Answer: Acupuncture treats immune health, inflammation, red & itchy eyes, sneezing, runny nose, and headaches. The key is sticking to weekly treatments and listening to your very wise Acupuncturist’s advice. I will usually have patients start weekly visits halfway through March (I am located in Massachusetts- it may vary depending on your location) and continue through April/May. Acupuncture works, but even better preventatively- you don’t have to suffer! Honey can be used as a cough syrup and to reduce inflammation. It also contains trace amounts of flower pollen. Exposure to small amounts of allergens repetitively may reduce allergy symptoms. My favorite local honey is from Little Beehive Farm in Holliston, MA. Neti Pots use gravity to filter saline solution through the sinuses, clearing allergens and cleansing the nasal passages. I recommend investing in a ceramic option, my favorite is from Himilayan Chandra, also available in-office! It’s totally safe to use the neti pot daily, usually at the end of the day to flush out allergens. If your nasal passages start to feel too dry, use it every other day instead. 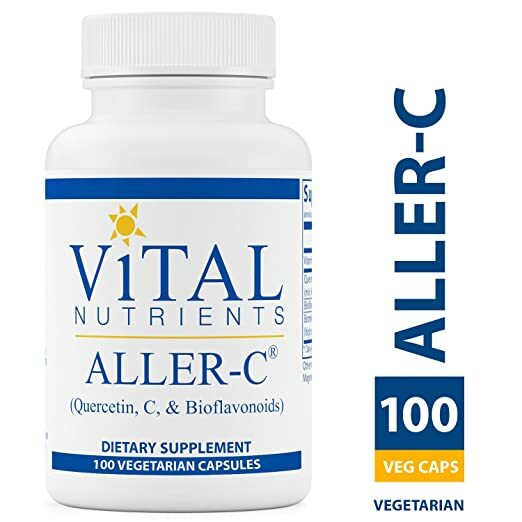 Aller-C by Vital Nutrients is a supplement option that offers sinus and respiratory support. When taken daily, it can reduce allergy symptoms. Follow instructions, and talk to your local healthcare practitioner if you have questions or wonder how it would fit in your daily routine. Eucalyptus, Green tea, peppermint & ginger tea help treat allergy symptoms including inflammation, sore throat, itching and redness. My favorite brands are Traditional Medicinals and Yogi. Add some honey for added support. An air purifier can clear pollen, animal dander and other allergens from the air in your home. Keeping an air purifier running during the day and at night may help with allergies. Just make sure you remember to vacuum the filter weekly and change carbon filters every 3 months. My favorite air purifier that won’t break the bank here. Yoga can help boost immunity and in particular, pranayama (or breathwork) can increase lung capacity and function. Start with a three part breath: sitting in comfortable seated position, break the inhale into three breaths. Start filling the chest, then fill the ribs, then the abdomen. When you exhale, start at the bottom and work your way up, engaging abdominal muscles at the end of the breath to release as much air as possible. Repeat 10-20 times. Acupuncture supports lung function and boosts immunity. It helps prepare the body for allergy season by increasing Lung Qi (Lung energy) and grounding the system. It reduces inflammatory response and is a great alternative to medication. Why can’t I just use over the counter medication? Short-term affects of anticholinergic drugs (like Benadryl) include fatigue, dry mouth, brain fog and constipation. A study from the University of Washington found that long term use gave users an increased risk of dementia. Be aware of the risks of any medication and treatment, including the natural ones! Be an advocate and an educator for your own health. If you’d like to schedule a visit, click here for scheduling. Check out my website, Facebook, Instagram, or Twitter for more information on acupuncture, yoga and natural treatments. Is it me, or has there been A LOT of stuff going around this winter season? Even at the tail end, I’ve had patients coming in with congestion, runny noses, coughing and sneezing! Here are my helpful tips on how to avoid getting sick, what to do at the beginning of an illness, mid-illness and after illness to rebuild. Remember, the best and most effective way to avoid illness is to wash your hands thoroughly! As invincible as we may feel, we often ignore the initial signs of getting a cold. Things like fatigue, aching neck, or a sneeze here and there. In Chinese medicine, the neck aka the “wind-gate” allows pathogens to enter the body. The two main pathogens we consider is wind-heat or wind-cold. Wind-heat usually manifests with a sore throat, feeling warm, yellow or green-colored phlegm, and aversion to heat. Wind-cold usually manifests with chills, aversion to cold, stiffness in body or neck, headache, and white or clear-colored phlegm. Cover your wind-gate! Wear a scarf, or a hoodie to keep the back of the neck warm and protected. Boost your immunity through regular acupuncture visits, yoga, plenty of water intake (at least 1 liter per day), healthy diet (see my blog about making changes that last) and exercise. During cold and flu season, especially if you think you may be regularly exposed, take a daily dose of vitamin C, garlic, or echinacea and goldenseal. Boost Lung qi through breath work and meditation. Get plenty of sleep (see my blog about sleep hygiene)! Get a neti pot! I know it sounds crazy, but the neti pot clears the sinuses, clearing out allergens and inflammatory particles. It works great preventatively and can also be used once you are stuffed up and miserable. This means your cold is still on the exterior, you want to knock it out before it goes interior. Make an appointment with your acupuncturist same day, if possible. Boost your vitamin C intake. Massage the base of the skull to stimulate the wind gate. Massage Liver 3 and Large Intestine 4 acupuncture points. Drink a tablespoon of apple cider vinegar (or fire cider) mixed with 4 oz. of warm water. Gan Mao Ling is a commonly prescribed Chinese Herb to take in the early signs of illness, please before taking an supplements talk to an herbalist or health care provider. Now you’re sick, and miserable, and sad. Here are some things you can do to feel a little better. Neti pot! Clear out phlegm and mucous to keep the nasal passages breathable and the take a load of pressured sinuses. If you have a stuffy nose, massage Large Intestine 20, Bladder 2 and Gallbladder 14. To stimulate the immune system, massage Lung 7 and drink echinacea tea. If you’re coughing up phlegm, massage Lung 4. For sore throat, massage CV22 and try Loquat Syrup, manuka honey throat and chest syrup, and throat coat tea. Sometimes, once we feel better, we forget we were ever sick! Being sick depletes the body, it’s important to build yourself and your immunity back up with acupuncture. Acupuncture is an amazing preventative treatment. Many of my patients come once a month to once every 6 weeks for maintenance. We rebalance the system, move stagnations and build deficiencies. Contact me, follow me on Instagram, Facebook and Twitter, or read my blog for more information on how Acupuncture can help you! After all the holiday eating, drinking, and being merry, I think we’re all in need of some serious detox. But what exactly does that entail? There are lot of options for detox, but what’s right for you? Here are some easy tips to incorporate into your already very busy life! There are a lot of things that can wreak havoc on our insides. Many create inflammation and affect the way our bodies process food. Eliminate caffeine, any drugs or alcohol, gluten, refined sugars, and dairy to start. Check out my Making Changes that Last blog for more information on how to change your diet progressively. My Tip: Read your food labels! What are you actually putting in your body? Look for things like artificial sweeteners (Aspartame, Sucralose, Saccharine- check out a full list here), genetically modified ingredients (check out the Non-GMO Project), high Fructose Corn Syrup (now labeled as fructose or fructose syrup), nitrites (found frequently in hot dogs and sandwich meat), artificial coloring or flavoring, and over-processed foods. Here is more information from the FDA about food ingredients, additives and colors. Water is necessary for the body to function. Most of our bodies are used to running dehydrated because we do not drink enough water! Water is essential to maintain a healthy balance of body fluids. These body fluids are necessary for digestion, circulation, muscle tone and beautiful skin! My Tip: Check out my instagram, for my favorite detox water recipe. Green tea is great to boost metabolism, it moves stagnation and clears impurities in the system. Don’t go too overboard, it has caffeine and may keep you awake at night- try to intake it in the morning to early afternoon, no more than a few cups a day. I’m going to let you in on my favorite detox bath recipe. By adding essential oils to castille soap first, they become more water-soluble and don’t just float in the tub. If you’re not a bath person, you can either add the oils to a diffuser or to a carrier oil to apply topically. Instructions: Combine Essential Oils with 2-4 tbsp of castille soap in a small container, add mixture with 2 cups of epsom salt to bath, soak at least 20 minutes and enjoy! Cardiovascular health is always important. The heart pumps oxygenated blood throughout your system, allowing your body to function properly. A healthy body starts with a healthy heart. From a Chinese Perspective, exercise moves stagnation in the body. Stagnation is the cause of disease, by moving the body, we move stagnation. My Tip: Start small. Add in 2 days a week of 20 minutes cardio, this can be as simple as a brisk walk! A good detox can’t be successful without a little mind-body connection. Being mindful helps productivity and lowers stress levels. Check out this article for how to start a meditation practice if you don’t already have one! Yoga calms the mind and moves stagnation. Hot yoga helps you sweat out toxins! Lots of studios offer new member specials or a free first class, so it’s easy to try! My Tip: Be wary, if you do take a hot yoga class, be sure to drink plenty of water before and after and listen to your body! Not everyone is made to be folded up like a pretzel or to stand on their head. I have a specific detox protocol, but acupuncture can help assist with detox in a few ways. It moves stagnation (see exercise above), regulates metabolism, regulates fluids and calms the mind. If you’d like to schedule a visit, click here for scheduling. Otherwise, check out my website, Facebook, Instagram, or Twitter for more information. One of the hardest, most challenging things to change is metabolism. I often encounter patients who are frustrated with dieting, exercising and not noticing any change in weight. Here are some tips to help slowly shift your metabolism– but first remember to be patient and kind with yourself and your body, it is often a long process, but it will contribute exponentially to your health and happiness. Like any change, habits that are cultivated slowly and with positive intent tend to stick. This is why YO-YO dieting doesn’t work. If you go from eating burritos to a daily salad, your calorie intake has significantly decreased, and you are essentially starving your body, which is why it pulls from your fat reserves and you initially lose weight. This weight loss will often slow, as your metabolism slows to keep up with your daily metabolic function. Keep it simple. Coconut yogurt, boiled egg, gluten free granola bars, leftovers. For dinner, healthy crockpot meals, pre-made salads. The more prepared, the more food you have available, the less you’re likely to eat what you shouldn’t. A helpful prep book here. My tip: On Sundays (or whatever shopping day you use) create a meal plan for the week (Breakfast, Lunch & Dinner) for each day and make a grocery list. Often leftovers become lunches, making your life much easier. This is also a great way to reduce waste of produce by planning ahead and knowing how you’re going to use each item. I know, I know, easier said than done. It’s easy when you’re on the go to stop and grab a snack or meal you know you shouldn’t. If you are meal prepping and planning, don’t buy unhealthy foods so they aren’t in the house. My Tip: Everything in moderation, don’t starve yourself of the things you love, just limit them. Everyone deserves ice cream every once in a while. If you don’t like salads, then you’re going to find it very hard to stomach your new diet. Use cooked veggies, or make healthier versions of your favorite things at home. Use plain yogurt instead of mayo, organic fruits and veggies, or grass fed beef. My Tip: From a Chinese perspective, salads are very energetically cold and can be taxing on the Spleen, leading to digestive issues if you don’t already have them, so if you do love salads, make sure to have a nice warm cup of lemon or ginger water afterwards. Remember, you’re trying to create healthy habits- by succumbing to excessive or bad habits one day a week, you are revisiting those behaviors and not moving away from them. Like I said above… everything in moderation. My Tip: Instead of a cheat day, have a couple meals a week where you aren’t concerned about calories, really enjoy them, and make it something you really love like a burger or pizza night. Remember, you can always get healthier versions of things by using organic veggies and grass-fed beef. Most people are chronically dehydrated. Imagine an engine with no coolant or oil, it wouldn’t last very long on the road, and it’s miraculous what the human body can function on with little to no water. Forget your 8 glasses- the average person should be drinking at least 2 Liters of water per day. More active people should add an additional Liter plus a coconut water or two. Coconut water has natural electrolytes and none of the added sugar and other ingredients you find in Gatorade. Yes, you may use the bathroom several times the first few days, but your body with eventually adjust to the increase in water. My Tip: Buy a 1 liter water bottle and place 2-3 elastic bands around it, every time you finish a bottle you take a band off. Realistically, one band before 10am, one band before 3 pm and one band before 7pm (try to finish at least an hour before bedtime to avoid bedtime bathroom visits). Skipping breakfast or lunch can play a huge role in your slowed metabolism. Your body needs food to function, if you have a low caloric intake, your body will compensate by slowing metabolism and adjusting to this new norm. My Tip: Start small, a granola bar, some coconut yogurt, a banana and slowly build up to a bigger breakfast. You may notice some slight weight gain as your body adjusts to your new eating schedule, this is frustrating but normal, try to stay positive. That’s right, grazing has its perks as long as you do it right! Make sure you are consuming a healthy combination of carbs, fats and protein. My Tip: To start, you may actually have to schedule your meal times. This is easy to do if you’re already preparing your meals. Remember, coffee doesn’t count as breakfast! 9. What do cravings really mean? Sometimes craving certain foods means vitamin deficiency, imbalance with gut bacteria or even anemia. Make sure you are eating a balanced diet with lots of veggies, protein and limited fruit and gluten grains. My Tip: If you’re feeling concerned, find a nutritionist and get evaluated. Do you find yourself running around, or working at your desk while eating? This could be taking a toll on your metabolism and digestion. Meal prepping is great because you already will have prepared a balanced diet and can simply enjoy. The love you put into preparing your food will show. My Tip: Try to slow it down, take a lunch, and eat while you’re not doing anything else. Chew completely (I know, I sound like your mother), and take time to digest. Take a moment before and after you eat to be thankful for your meal and your body’s ability to process that meal. Humans originally survived on what was available locally during different seasons. Fresh veggies in the spring and summer, root veggies in the fall and winter. Make sure to incorporate local foods into your regular diet. My Tip: Find a local farmer’s market or farm stand, ask questions about where your food is coming from and how recently it was harvested. For many, inflammation can wreak havoc on the digestive system, it may help to eliminate inflammatory foods like gluten, cheese, refined sugars and packaged foods from your diet. My Tip: An elimination diet may help you determine what exactly is causing your digestive issues, but don’t forget to only add back one food at a time to see which is the culprit. I’d stay away from inflammatory foods for a month and then add them back one week at a time. Of course, after all this, you may still need a little extra help. Taking digestive enzymes during or immediately after eating meals will help aid digestion and ensure you are gaining all the nutrients you can from the foods you eat. Probiotics are essential for a healthy gut, which means a healthy immune system. Yogurt alone does not contain enough live organisms to make a big difference. I recommend Metagenics probiotic and Zenwize Health digestive enzymes. Proper sleep is essential for any body function, especially digestion! As your body enters that calm state (parasympathetic), the brain begins to redirect blood to internal organs including the stomach and digestion. Check out my blog post about healthy sleep hygiene for some helpful tips. Certain yoga postures are helpful to aid in digestion, however taking a regular class helps with overall mental and physical health. Of course, I’m slightly bias, but Acupuncture is another great way to aid with healthy metabolism. I often do detox treatments, treatments to aid digestion and ear press balls to help curb cravings. If you’d like to schedule a visit, click here for scheduling. Otherwise, check out my website, Facebook, Instagram, or Twitter for more information.